Just curious as there is a big price difference now specially as Axiom keeps going exponentially up. Can you really notice $1500 in the difference. also, with the SVS this would most likely able me to go with quad SVS for a bit more if I want. I have an EP500 and love it. But, I waited for Axiom to discount one on its DEALS page. There is an EP500 for about $1,100 right now. I have an SVS 20-39 and have had it for more than 10 years. Never missed a beat. Excellent sound quality. Very low wife acceptance factor (looks like a Rickover Marine Nuclear Power Plant). I think you would notice a pretty big difference. Just the size of the cabinet and this are some major differences. Troy ... The EP350 is a more suitable match to the SB2000. The SVS MAY do a bit more below 20 Hz... but the 350 will outgun it above 20 Hz and is an incredibly musical sub. If budget is a concern, EP350's from the outlet are a great choice. I have the EP350 now, got to upgrade. and was wondering about the SB2000 and the EP500. I missed the return date by a couple weeks, so got stuck with it. Just was wanting to know if there was a worthwhile $700 difference between the two. yeh I am in Canada so that's $1400. Troy - Give Ian a call and see what he can find for you. He's pretty good at making customers happy. Just found out that my EP-500 can not be repaired. This is quite disappointing. I was told that I could just purchase a new amplifier for it at a ridiculous price. This sub is used very rarely, and for it to fail like this is one thing. But to be then told that it can't be repaired makes me very nervous for the other Axiom systems I own. I have always recommended this company to others, and have opened up my home to strangers wanting to hear the different systems I have before making their purchases. That all stops now. What version of the EP500 do you have? that will play a big difference in the response that you'd get. if you have an older V1 or V2 unit, then as they are quite old, then the side of carrying parts for the unit by Axiom is understandable. If the unit is well outside of warranty, have you tried getting it serviced at any number of electronic repair shops? The unit is not complex. 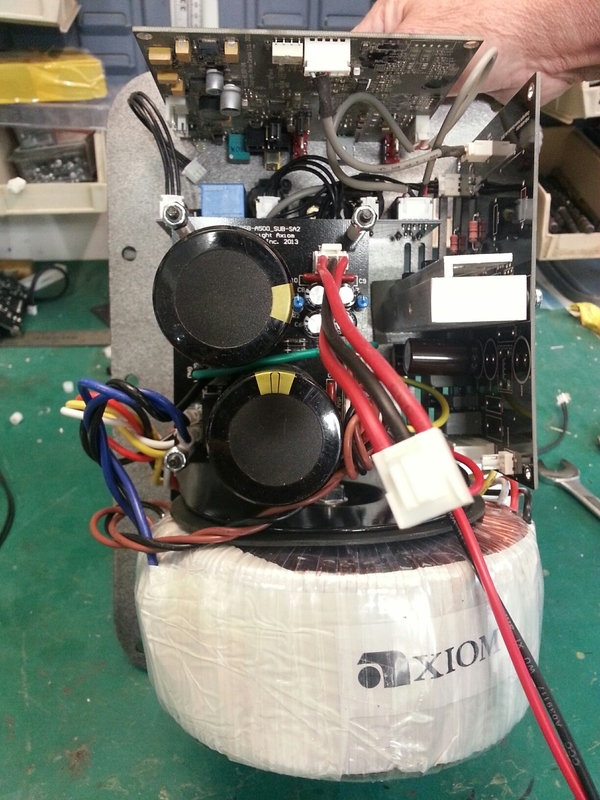 if it is a blown capacitor or something like that, ten a small shop might be able to trace down the defect and repair the unit for far less than the suggested replace the whole amp. Something to consider.